The PACT Act law went into effect on June 29, 2010. The PACT Act features several major components; it regulates the mailing of cigarettes and smokeless tobacco products to consumers through the U.S. Postal Service; Registration, Reporting, Delivery requirements, recordkeeping, List of Unregistered or Non-Compliant Delivery Seller's; increases penalties to a felony up to 3 years imprisonment and gives ATF inspection authority to examine any records required to be maintained and any cigarettes or smokeless kept on the premises. 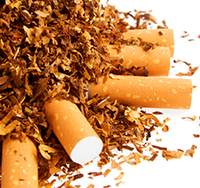 Any person who sells, transfers, or ships for profit of cigarettes or smokeless tobacco in interstate commerce, whereby such cigarettes or smokeless tobacco are into a State, locality, or Indian country of an Indian tribe taxing sale or use of cigarettes or smokeless tobacco or who advertise or offer's cigarettes or smokeless tobacco for sale, transfer or shipment. Common Carrier - means any person (other than a local messenger service or the United States Postal Service) that holds itself out to the general public as a provider for hire of the transportation by water, land, or air merchandise between a port or place and a port or place in the United States.